The flue is an integral part of your kitchen that removes the hot exhaust gases that are created when you cook. Why is flue cleaning so important? When food products are heated during cooking, natural oils and fats become vaporized and get drawn into your exhaust system. Up to 70 percent of this airborne grease will be trapped by the grease filter, but the rest of it passes through and attaches itself to the walls of the exhaust duct and the blades of the exhaust fan. These greasy deposits attract more and more grease. The efficiency of the exhaust system is reduced greatly by this grease build up, and therefore the exhaust temperatures increase. This causes the grease deposits to liquefy, and if they get hot enough a FLASH FIRE can occur. If the flash fire occurs within the grease filters or the area immediately behind the filters (called the plenum) the automatic fire system will automatically discharge and put the fire out. However, if the fire is above the automatic fire system’s sensors, then it is a job for your local fire department. The average response time in a metropolitan area for the fire department to arrive is 6 minutes. By cleaning your flue regularly, you can remove these grease deposits and significantly reduce your risks of a flash fire in your exhaust system. What flue cleaning methods are available? Hand scraping is the most common method, because it is the simplest. In this method, a service person physically scrapes the accumulation of grease from the walls of the exhaust system. While this can be effective, it is far from perfect. It is limited by the technician’s ability to access different parts of the flue. Steam cleaning requires more effort at the outset, but it also delivers better results. Setting up the equipment and completing the service both take some time, but the high-pressure hot water reaches into every nook and cranny and provides more thorough cleaning. How often should the flue be cleaned? A good rule of thumb for the average restaurant is to clean the flue every three months. However, this can change depending on the volume and types of food that are prepared in the kitchen. Fast food restaurants and kitchens that do a lot of charbroiling or frying will need to be cleaned monthly. Many restaurants prefer to have their exhaust systems hand scraped on a monthly basis and steam cleaned quarterly. This approach provides excellent protection at a reasonable cost. How can I check that the cleaning is complete? Unfortunately, many kitchen exhaust systems were not designed with maintenance in mind. You will be able to see the results of cleaning on easily visible and accessible parts of the system like the hood and the grease filter, but unless you have access panels spaced evenly along the ducts you won’t be able to check the results of duct cleaning for yourself. How will the technicians access the flue? The flue cleaning technicians will reach different parts of your flue through various access points. The most obvious one is the exhaust hood. Next come the duct access panels, which can be removed for cleaning and then sealed back in place using a special fire-rated caulking compound. Finally, there is the exhaust fan. Many kitchens have round aluminum fans that sit on the roof directly over the duct. If your fan was installed properly in accordance with building and fire codes, it will have a hinged base and extra electrical cable, so that technicians can tip it to the side for cleaning. What if I don’t have access panels? If your flue lacks sufficient access panels, Flue Steam can install them for you using NFPA 96 and California Mechanical Code approved methods and materials. Do Flue Steam’s services meet the NFPA and CMC requirements? Yes. After cleaning, Flue Steam will place a “Certificate of Performance” sticker showing the date of service, the service frequency, and if any inaccessible areas exist in the system. Keep this sticker on your hood as proof that you have fulfilled your code obligations. What other services does Flue Steam provide? In addition to exhaust system cleaning, Flue Steam can also help with maintenance like checking belts, greasing bearings, and replacing parts. We also provide all the ancillary fire safety services you need, including grease filter exchange, automatic fire suppression systems and portable fire extinguishers. Is Flue Steam licensed and insured? Yes, our technicians are licensed to provide flue cleaning and service and we carry complete liability insurance. 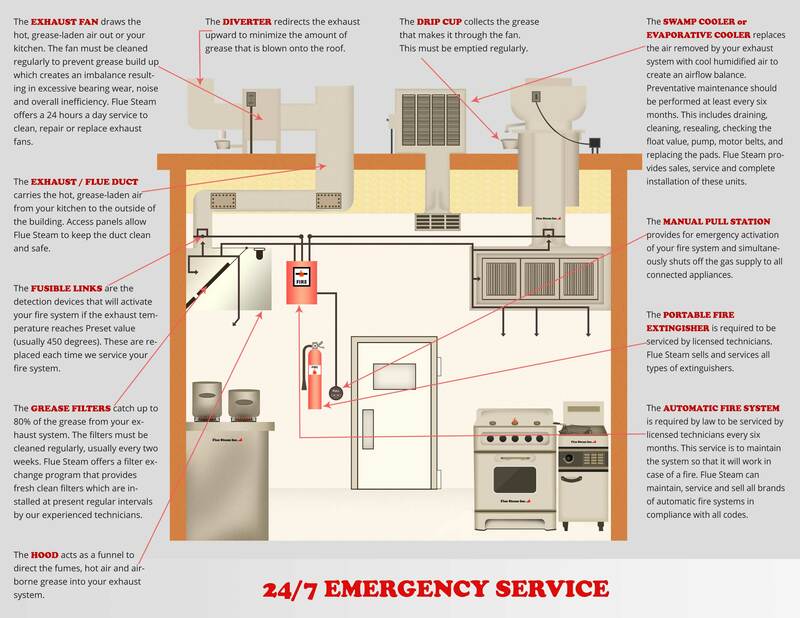 Yes, we are on call to provide emergency repairs to your fan motor, swamp cooler, automatic fire suppression system, and automatic gas shutoff valve 24 hours a day. Emergency cleaning is also available.